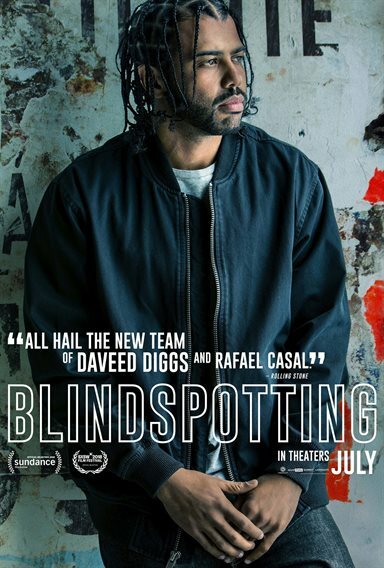 Download Blindspotting in Digital HD from the iTunes store. Blindspotting images are © Summit Entertainment. All Rights Reserved. Racism and racial profiling are unfortunately still a very large issue in this country. Nearly every month there is a major news story regarding a young black man being killed by a member of the Police force. The subject has been regurgitated time and time again in newspapers, on television, in books, and in the movies. 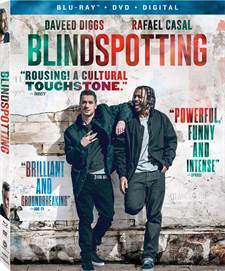 For Blindspotting they are just two of the themes dissected and analyzed in the film. While the film has a fairly short running time of an hour and a half, it still manages to address these and other issues in a unique and realistic manner. Collin (Daveed Diggs; Wonder) is a convicted felon living in a halfway house while on probation -of which he has four days left. Miles (Rafael Casal; The Away Team) is his best friend – a white man living in a predominately black neighborhood. Val (Janina Gavanka; True Blood) is Collin's ex-girlfriend who works for the same moving company as Collin and Miles. She and Miles don't get along as she thinks Miles brings Collin down. All she wants for Collin is to "better" himself while Miles just wants Collin to be the same "homeboy" he has hung out with since they were twelve years old. Over the course of four days, we watch as Collin questions everything he knows as he tries to stay out of trouble. First, he is in a car with Miles who has an illegal gun (that Collin wants to know nothing about). Then Collin watches as a white police officer kills an unarmed black man but chooses not to speak up about what he saw. Finally, he watches as Miles beats up some guy and shoots off said gun (while is terrified he will get picked up by the police, in violation of his probation, for what Miles has done). Diggs and Casal are masters of spoken word verse and they utilize it in the film as a way to move the story along and offer insight into their emotions and thoughts. There are several spots where this is used as a device instead of a long monologue and they are perfectly placed and beautifully performed (especially when Diggs' confronts the police officer who shot and killed the unarmed black man). Diggs really shines in this film unlike some of his previous work and Casal is excellent as well. Gavanka is well cast and rounds out this trio nicely. Poignant and timely, this movie makes its point without bashing the audience over the head or by becoming preachy. Diggs and Casal have written a modern masterpiece to create a dialogue of some of the issues plaguing this country. The addition of the spoken word verses are genius and well planned. They aren't superfluous in any way and don't overextend their moments on screen. They are well placed and interject a point without being overused and they don't suffer the fate of some musical numbers in a film that jar the audience out of the moment. They flow beautifully and seamlessly throughout the script. The Blu-ray's 1080p resolution is striking as it highlights even the smallest details. The contrast between day and night is strong with the bright sun opening up the color spectrum while the night scenes are deep and true. The Dolby Atmos audio highlights the soundtrack and the magnetic verses Diggs and Casal recite so effortlessly, The combo pack only has a few extras including deleted scenes, Straight from the Town: Making Blindspotting, Carlos López Estrada: A Director's Diary and Audio Commentary with Diggs and Casal. The best of these is the making of – running almost 30 minutes long. Blindspotting is enjoyable and entertaining while offering a sober look at some of the things facing our young, black male population, especially in urban settings. Serious moments peppered with humor and fun keep this film from being too bogged down in the underlying messages it hopes to present. These performers and writers guided by director Carlos López Estrada (Identity Theft) shine in this vehicle that doesn't necessarily beg for social change but more so asks the audience to try and understand the problems from their point of view. Such a well-done movie worthy of your time.